The Infinix Note 5 Stylus comes in a different design with the Note 5 even though it’s the advanced version of the phone. The device is blessed with a beautiful body design and ample RAM. The Tecno Camon 11 Pro is the bigger model of the Camon 11 and it has a huge RAM with beautiful body design as well. We will be looking at the comparison between the Tecno Camon 11 Pro and the Infinix Note 5 Stylus. On the body, both phones are looking elegant and they have a fingerprint scanner for security. The Camon 11 Pro has a notch up front with small bezels surrounding the screen area. It also has a dual rear cameras stack vertically while the Infinix Note 5 Stylus has a single rear camera. The Camon 11 Pro measures 153.7 x 74.5 x 8.5 mm and weighs 158 gram. The Infinix Note 5 Stylus has a beautiful body design with notch free and a smooth panel. It measures 156.5 x 76 x 7.5 mm and weighs 152 gram. On the front, the Camon 11 Pro has a display screen size of 6.2 inches under IPS LCD capacitive touchscreen with a resolution of 720 x 1500 pixels and 268 PPI density. 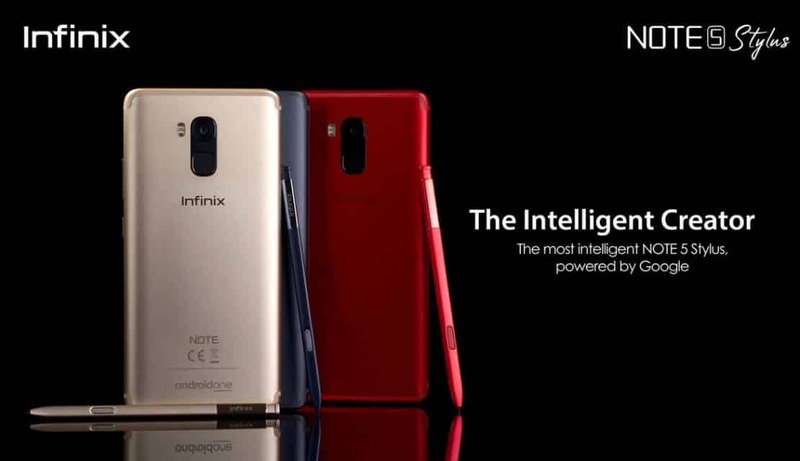 The Infinix Note 5 Stylus, on the other hand, has a display screen size of 6.0 inches under LTPS IPS LCD capacitive touchscreen with an impressive resolution of 1080 x 2160 pixel and 402 PPI density. The Camon 11 Pro has an 84.5% screen-to-body ratio with Asahi Dragontrail Glass, while the Note 5 Stylus has a 78.1% screen-to-body ratio with Corning Gorilla Glass. The Infinix Note 5 Stylus wins with a better screen which will offer quality images when viewing. The Tecno Camon 11 Pro has a dual rear cameras set-up. The device has a 16 MP (f/2.0, AF) + 5 MP (depth sensor) with quad-LED flash, while the Infinix Note 5 Stylus has a 16 MP (f/2.0, 24mm, 1/2.3″) with PDAF, and dual-LED flash. Both phones feature the same Quad-LED dual-tone flash, HDR, panorama and the will also shoot 1080p videos at 30 seconds per frame. For selfies, the Camon 11 Pro has a front facing camera of 24 MP with f/2.0, 1080p@30fps, FaceID, and dual-LED flash, whereas the Infinix Note 5 Stylus has a 16 MP (f/2.0, 1/2.8″) with 1080p, and LED Flash. On paper, the Camon 11 Pro wins. The Camon 11 Pro is equipped with MediaTek MT6762 Helio P22 chipset with an octa-core processor that clocked at a speed of 2.0 GHz, while the Infinix Note 5 Stylus has a MediaTek MT6763T Helio P23 chipset with an octa-core processor that runs at a maximum speed of 2.5 GHz. Both phones are powered by Android 8.1 Oreo operating system and they have support for dual SIMs and 4G LTE network. They also have a similar inbuilt memory of 64GB which is expandable with micro SD card. The Camon 11 Pro has PowerVR GE8320 GPU with a huge RAM of 6GB which will surely deliver in gaming, while the Note 5 Stylus has Mali-G71 MP2 GPU with a backup of 4GB RAM for smooth performance. The Tecno Camon 11 Pro has a nonremovable battery capacity of 3750 mAh, while the Infinix Note 5 Stylus has a nonremovable battery capacity of 4500 mAh which will surely last longer than it’s rival. The Camon 11 Pro will cost $223, while the Infinix Note 5 Stylus will sell at a price of $199. The Camon 11 Pro has an edge on the RAM and camera, while the Infinix Note 5 Stylus has an edge on the battery, display and also on the chipset. The phone is more affordable and it will surely make a wise buy.